The Big Game is 2/5! The Big Game is just two weeks away. Whoever YOU are rooting for, we’ve got you covered. 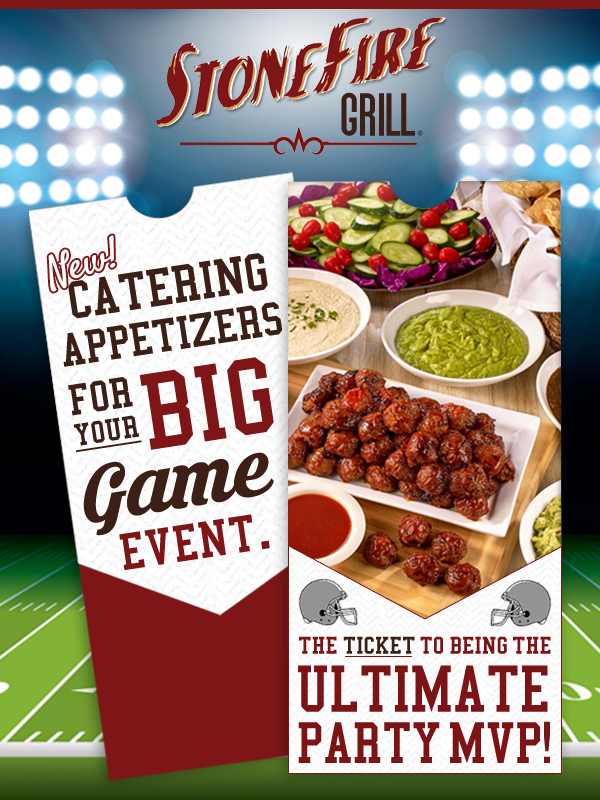 Whether you are relaxing at the house with 5 or throwing a huge party for 100, STONEFIRE Grill has the basics covered. Our NEW Catering Appetizers are perfect for enjoying while sipping an ice cold beer or beverage. Our BBQ Meatballs, Chips + Salsa + Guacamole, and Hummus Trio are perfect for sharing. Simply order ahead through our Catering Specialists (48 hours required) and they will be ready for pick up when you are. Plus, you don’t have to prep anything! They will be prepared so all you have to do is take off the lid. Voila! If you’re looking for more, our Family Meals or Crowd Pleasers include our guest’s favorites. Each package includes your choice of meat, salad and our Freshly Baked Breadsticks. For example, our Whole Chicken Family Meal includes a whole chicken (Mesquite BBQ or Lemon Garlic), a medium salad (Garden, Caesar, Cartwheel or Greek), and 12 Freshly Baked Breadsticks. Our Favorite package is perfect for 6 or more. This includes a whole chicken (Mesquite BBQ or Lemon Garlic), whole tri tip (Mesquite BBQ or Pepper Garlic) or full slab of ribs, a 16″ two-topping pizza or 2 large sides (Garlic Mashed Potatoes, Cowboy Beans, Nutty Coleslaw or Cauliflower Salad), a large salad (Garden, Caesar, Cartwheel or Greek) and 18 Freshly Baked Breadsticks. Looking to feed 20 or more? The Works is the ultimate Takeout package. With 4 whole chickens, 3 whole tri tips, 2 16″ two-topping pizzas or 4 large sides (Garlic Mashed Potatoes, Cowboy Beans, Nutty Coleslaw or Cauliflower Salad), 2 large salads (Garden, Caesar, Cartwheel or Greek) and 36 of our Freshly Baked Breadsticks. For only $207.99, feed an entire team for less than $10/person! We also sell our homemade pastas, market fresh salads and sides by the pans! For example, our fan favorite Pesto Pasta is only $28.99 for a half pan or $59.99 for a full pan. To view our entire catering menu, please click here. Looking for just meat? How about our delicious, slow cooked Mesquite BBQ Back Back Ribs? Finished on our Mesquite Grill and basted with our Signature BBQ sauce, enjoy for only $20.99. You’ll get 13 ribs and we’ll even cut them individually upon request! Don’t forget about our Freshly Baked Breadsticks and desserts! As you can see, we have plenty of options here at STONEFIRE Grill! Please give us a call at 888.649.5783 for more information. Ready to order? Order online now for quick and hassle free ordering! For even quicker ordering, download our NEW Ordering App for your iPhone or Android. Getting hungry? With 8 locations across Southern California, including Los Angeles, Orange County and the San Fernando Valley, find the location closest to you for freshly prepared, simply delicious meals. Choose STONEFIRE Grill for all your Dine In, Takeout and Catering needs!